A missing tooth not only detracts from your appearance, but also from your overall oral health. Once you lose a tooth, your jawbone will begin to atrophy and gradually be reabsorbed by the body. Fortunately, the oral surgeons at Oral & Facial Surgeons of Arizona can restore the strength and function of the jawbone, while readying the site for placement of a dental implant, using a technique called bone grafting. If you suffer from compromised strength in your jawbone or are exploring whether you are a suitable candidate for dental implants, contact our Phoenix or Tempe office to schedule a consultation with one of our board-certified surgeons. During your initial consultation with one of our oral surgeons, you will learn whether your unique condition would benefit from a bone graft, or “pre-prosthetic surgery.” If you are missing teeth, dental implants may be a suitable reconstructive procedure, but you’ll need an adequate amount of healthy jawbone at the proposed implant site. Bone grafting effectively builds up bone mass in areas of your jaw that may have been compromised due to injury, previous extractions or gum disease. 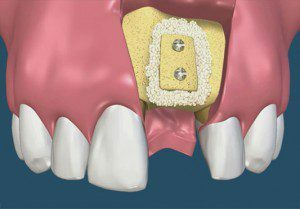 After bone grafting is complete and your jawbone has returned to its healthy state, it’s time to place an implant. At Oral & Facial Surgeons of Arizona, our experienced surgeons specialize in dental implant treatment. We adhere to the highest standards of care and use cutting-edge implant technology to ensure you can enjoy a lifetime of use from your implant and prosthetic tooth. The benefit of successful bone grafts and dental implants is twofold: You can enjoy restored function, including improved ability to speak and eat, while enhancing the appearance and symmetry of your smile. Anyone who has lived with one or more missing teeth understands the devastating effect it can have on overall quality of life. At Oral & Facial Surgeons of Arizona, we are committed to helping you achieve maximal oral health and renewed self-confidence. Call today to learn more about our bone grafting techniques or to schedule a consultation. With proper care, dental implants can last a lifetime. We believe you should not have to live with frustration, pain, and a reduced quality of life due to missing teeth. To learn more about our dental implants and how they can improve your smile, schedule a consultation with one of our trained surgeons, Drs. Michael W. Golding or J. Gregory Sabol, and they can explore the bone grafting options available to you.